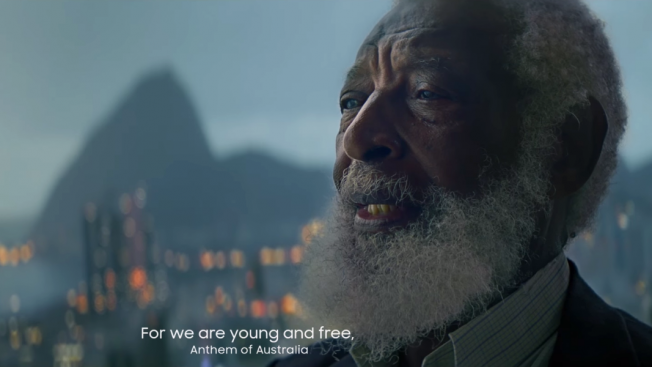 The world's national anthems come together to form a song of international unity in Samsung's latest Olympics spot. From Leo Burnett Chicago and Leo Burnett Sydney, the new TV and digital spot does more than just promote the Samsung Galaxy S7 Edge. At a time when the world feels like a scary, fragile place, it focuses on bringing people together at one of the world's biggest events. "The Anthem" opens with a young girl holding the Samsung phone and singing the national anthem of Botswana while enjoying a beautiful view of the sea. Instead of continuing with the same anthem, the spot jumps to another country, another person and another song. With the introduction of each anthem, viewers are introduced to a new location, intentionally contrasting with the home of each song. The anthem of Malaysia is sung by a woman in Paris, for instance, and New Zealand's national anthem plays loudly in England, highlighting the notion that we live in a world without borders. "'The Anthem' is a reflection of the Samsung brand and our continuous pursuit to break down geographic barriers and unite the world through technology and borderless communication," said Younghee Lee, evp of global marketing and mobile communications business at Samsung Electronics, in a statement. "By singing one anthem, fans and athletes across the globe can feel a shared sense of pride and unity and together celebrate collective progress, which is integral to the spirit of the Olympic Games." Through our unity and harmony, we'll remain at peace as one. Samsung's new campaign also features a number of global athletes, including British diver Tom Daley, French Paralympian Arnaud Assoumani, American runner Alysia Montaño, runner Margret Rumat Rumat Hassan of South Sudan, Australian boxer Shelley Watts and Brazilian surfer Gabriel Medina. The athletes will be featured in other Samsung work leading up to the Rio Games, including Rumat Rumat Hassan's appearance in the heart pounding ad "The Chant." More Olympics work for the brand is set to be released as the opening ceremony in Rio de Janeiro approaches.